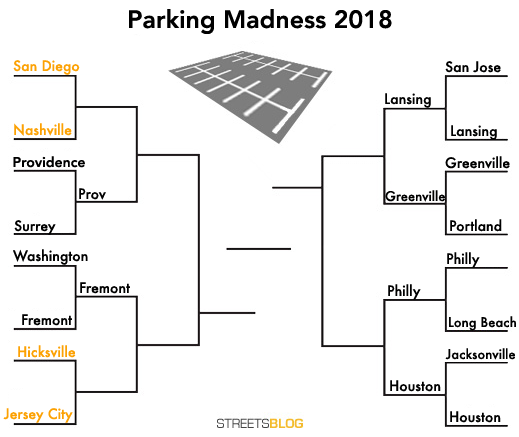 Welcome to the final match of round one action in Parking Madness, our annual tournament to “crown” the most depressing parking crater in North America. Your votes will narrow our field of 16 down to eight quarterfinalists. The parking craters already through to round two belong to Houston, Lansing, Providence, Greenville, Fremont, and Philadelphia. You can still cast a vote open for Hicksville vs. Jersey City. 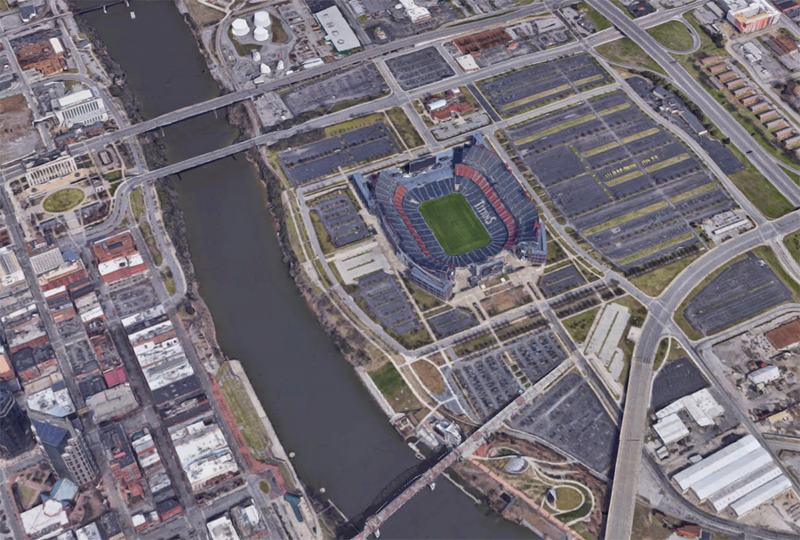 Today’s match will make you wonder why cities can’t stop subsidizing large single-purpose venues with lots of parking, as a stadium crater in Nashville takes on an arena crater in San Diego. This is an area of San Diego that connects to the communities of Ocean Beach and Point Loma. It is predominantly industrial with suburban big box stores of which are served by the parking lots. Sports Arena Blvd, Midway Drive, and Rosecrans Street are the major arterials which connect the communities, but they are entirely bloated high speed stroads with horrendous walking and biking infrastructure. Intersections in this part of town are huge, with crossings ranging from 4-8 lanes. The San Diego Trolley (light rail) Old Town Station is on the other side of an underpass of I-5, but it’s nearly impossible to reach it on foot and extremely dangerous by bicycle. The highly desirable Liberty Station as a destination is completely cut-off from any mode of transportation besides a car except for two bus stops and a narrow bike lane along the Rosecrans Stroad of the premises of Liberty Station. 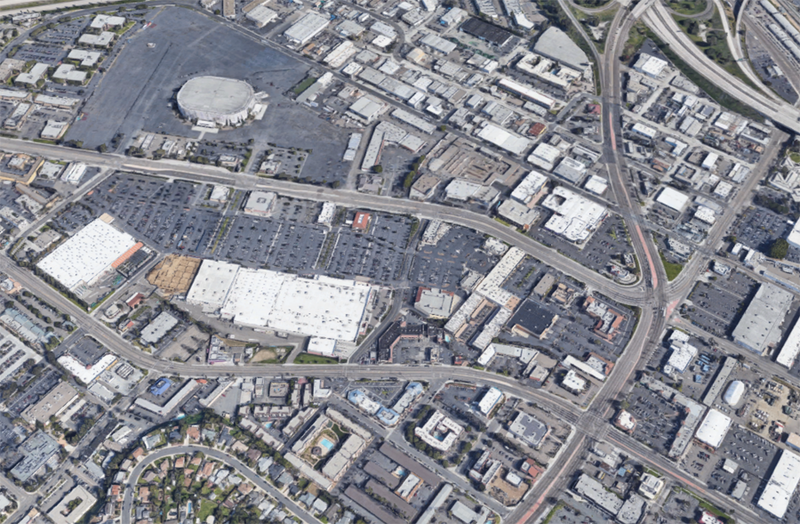 Even then, More than half of the land devoted for guests at Liberty Station is devoted to surface parking lots. San Diego has plans to redevelop this area, but the scale of construction required to fix the issues will take many decades and enormous political will power. In the meantime, this area is [one of] the biggest urban blights on the coastal San Diego landscape. The area around Nashville’s Nissan Stadium was nominated by reader Adam Blair. Unlike some of the other stadiums in the competition this year, Nashville’s is very close to downtown — which you can see just across the Cumberland River. The concept of the complex: a park. More than 200 trees have been planted. The stadium cost almost $300 million to construct. Metro Davidson County provided $154 million of that, and the state kicked in another $67 million. Which deserves to go on to the second round? Valley View Casino Center isn’t a casino. It’s a sports arena. Nashville is my pick to take out the whole thing. It’s basically an area the size of downtown, across the river from downtown, with nothing built there. Yep. the situation in Nashville is truly awful. So much wasted land so close to what’s become very expensive downtown property. The city of San Diego recently repaved the stroad that cuts through the parking crater (Sports Arena Blvd). It’s so wide – 5 eastbound lanes at one point – that they were able to add buffered bike lanes… except directly in front of that Target parking lot. The reason? Street parking! They actually dump bicyclists into 50 MPH traffic with sharrows instead: https://twitter.com/uselessopinion/status/968718316910141441. in some places but not in many American cities. 2nd why not go after the stadiums themselves they gobble down public taxpayer money as well, billionaire team owners trick governments to sink the capital out of your wallet to have this stuff built. Too many nominations for stadium lots this year, they are awful uses of space but they are never going to be built without parking, especially since so many of them are on the peripheries of cities or out in the middle of nowhere like the Redskins’ stadium. The destruction or misuse of what should be viable city centers like Lansing or Providence are much more offensive in my mind. Tough one but I vote Nashville because A) they could just build some garages and B) their train station is right across the river. Wouldnt be hard to add some shuttle buses to cross the bridge and offer trains during games. Then maybe plunk down some nixed mixed use urbanism next to that lovely greenway by the river? In Nashville’s defense, the lots are used during the week for downtown employee parking with a shuttle that takes you across the river into downtown. It runs with excellent frequency and has multiple stops once in the city core. Yes, it is an eyesore, but the city realizes it, has planted trees, and uses it in a very practical manner. Living very near the San Diego sports arena…I live in Ocean Beach/Point Loma, the neighborhoods adjacent to this place. Near both the I-5 & I-8 (very easy access to the area for cars). I vote for this one because of the sheer amount of people coming into and out of this area on any normal day. This is only 1 mile from the beach. Add a concert or hockey match, and you have a cluster of major gridlock. The Nashville site isn’t faced with as crazy an amount of traffic and people as the San Diego site. The parking lot is also used as a swap-meet so that it serves a purpose other than sitting empty in between events. Wait, why is there street parking on a 50 MPH thoroughfare? Yes but they could be built with parking structures and connected to transit. You mention Fedex Field but what about Nationals Park as the alternative? Good question. Definitely not needed given the massive parking lot that fronts the street there. In today's matchup, a depressing abundance of commuter rail parking in the Bay Area takes on a mammoth parking crater enveloping three separate light rail stops in Denver. The first match of 2018 pairs two repeat offenders. Vote for the worst parking scar! A major Bay Area transit station takes on a state capitol in the cradle of America's automotive industry.